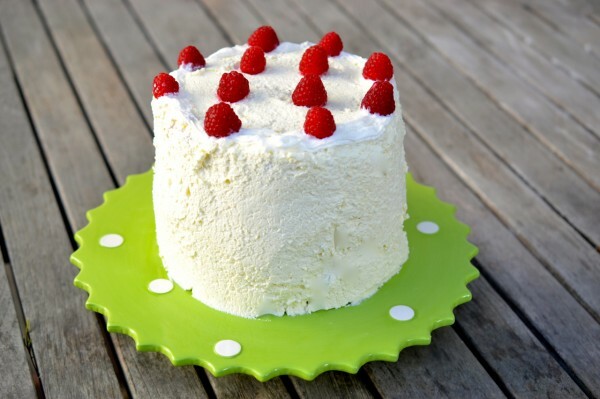 Imagine a cake that has only two ingredients, requires no cooking, is gluten-free and sugar-free (if you want it that way), is ready in about 30 minutes, and makes an impressive “pow” of an appearance at any summer barbeque or picnic. 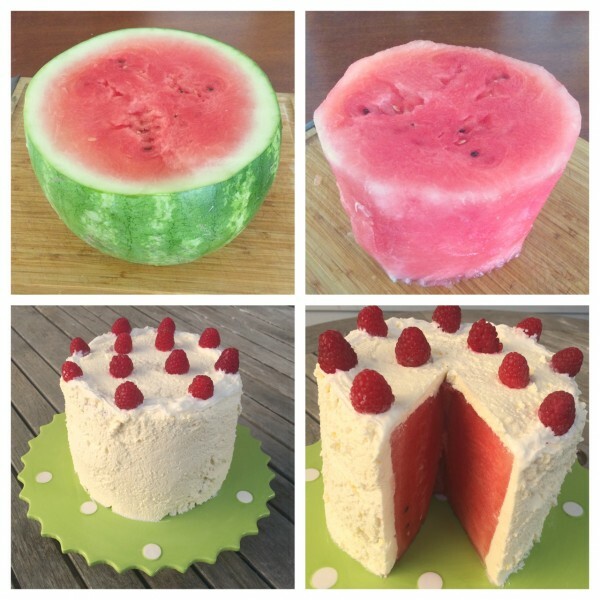 Yes, it’s possible… in the form of this no-bake summer watermelon cake. 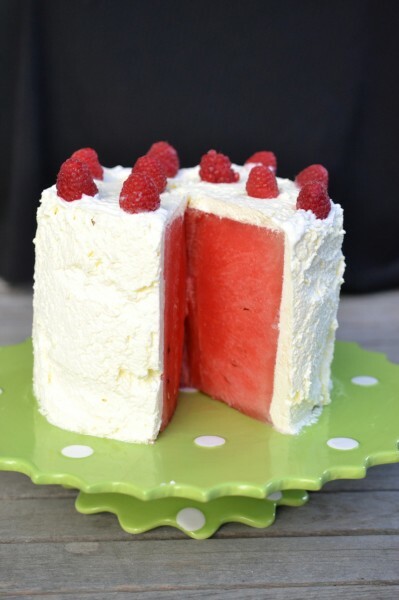 If you’re on Pinterest, you’ve probably seen this cake plenty of times, so you’ll know that we didn’t invent it. But if you’re not on Pinterest, like our kids, you’ll be blown away when you see it. This cake is so tasty everyone will want a slice, and it’s so easy even a novice cook could make it. Slice both of the rounded edges off so you are left with a large tire-shaped disc of watermelon. Carefully slice the rind off the outer layers of watermelon. Place the peeled watermelon on a cutting board or other resting spot where the juices can seep out. Meanwhile, pour the cream into a bowl and use the hand mixer to whip the cream until stiff peaks form. Optional: Add powdered sugar while whipping to give the cream a sweeter taste. Pat the watermelon down with a paper towel to remove as much moisture as possible; then place the watermelon on the cake stand or plate where you will be serving it. 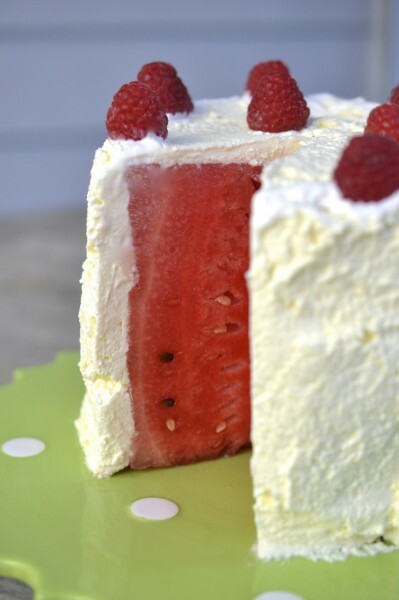 Carefully spread the whipped cream all around the watermelon as you would frost a cake. Decorate with fruit as desired. Serve immediately, or else chill the cake for up to 3 hours before serving (don’t wait much longer than that or the cream will start to melt away). Serves 8 to 10. Hungry for more good ideas? You might want to check out a few of my Pinterest boards: Cool Snack Ideas for Kids, For My Next Party, and Food That Makes Me Smile – Maybe Even Laugh. Amazing! Love that! I would also be tempted to “frost” it with slightly softened ice cream, and stick the whole thing in the freezer. I have no idea how that would work, but I sorta want to try it! Thanks, Dorothy! I love the way you think! You could be on to something amazing! Oh my goodness!! Pure brilliance!!! Nope… I hadn’t seen it before, so I’m particularly glad you posted!!! Oh, good – I hope you try it, Kim! My kids LOVED it!